Learn to treat with IMMEDIATE result! This course provides the basic foundations of five main (six in total) systems of the Balance Method/System. The systems are rooted in the concept of healing the body by balancing meridians. Students will learn the history of the Balance Method/System, the basis of each of the five main systems, and the logical processes for determining the meridians to acupuncture, including an easy-to-use format to outline the treatment plan. Participants will be able to apply the concepts immediately in practice and develop effective treatments. A detailed explanation of the Mirroring and Imaging Formats will also be explained to assist participants in effective point selection. Dr. Tan will show how to use distal points in order to avoid aggravating the area of discomfort. This course is great for both new students, as well as experienced practitioners. Numerous cases will be discussed with the application of each of the five main Systems for each disorder. Finally, hands-on demonstrations will allow attendees to see the Balance Method in a practical format of real treatments. The focus will be on the treatment of pain and tightness, including all types of musculoskeletal pain and injuries, chronic pain, as well as tingling, burning and numbing due to a variety of causes. Participants will be able to apply the concepts immediately in practice and develop effective treatments. 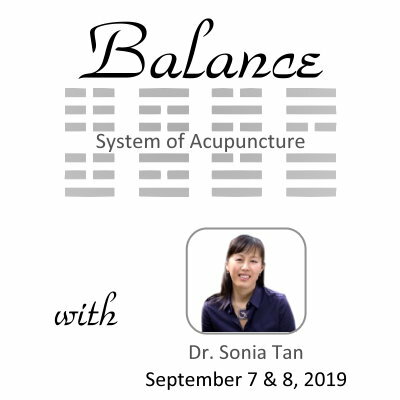 The Balance System of Acupuncture as taught by Dr. Sonia F. Tan is based on the culmination of her education, research and experience with various teachers including the late Dr. Richard Tehfu Tan, Dr. Daoshing Ni, Dr. Yvonne Farrell and Dr. Jeffrey Yuen. Pre-requisites: License to practice acupuncture in their jurisdiction, with minimum 250 hours of foundational acupuncture training.